Find Used Tub Grinders, Horizontal Grinders, Screens, and More! Excellent condition. 650 HP CAT 2412 Engine w/ only 3,000 original hours. Heavy Duty machine (76,000 lbs), self-loader, fixed or swing hammers. high-lift & rotating cab. Magnetic tail pulley. 90 Degree tilt tub. 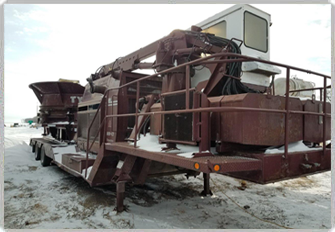 2000 Frontier F-14 Compost Turner for sale. Recently Serviced and ready to work. Tethered Remote. Call for more details!. Industry Resource! 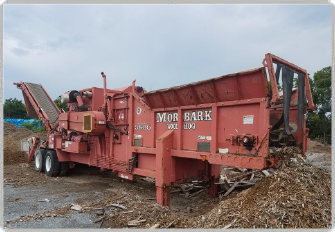 Information on running a succesfful wood waste operation and the equipment required. For industry entrants as well as seasoned operators. Quickly search for a regional grinder contractor online. Contractors, list your company for FREE! We carry belts, PTO parts, hammers, tips, and screens for most horizontal & tub grinders. Salvage Parts available! We strive to provide a full range of services. Please take advatage of what we can offer! 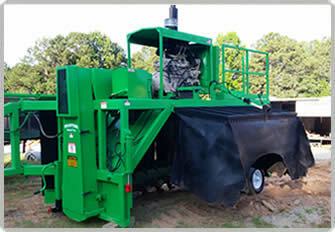 We buy salvage - damaged tub grinders, horizontal grinders, trommel screens, compost turners, and useable parts. Need an equipment appraisal? 30+ years industry experience with FHE, Morbark, Vermeer, Peterson, Diamond Z, Bandit Beast, WHO, and more! Can’t decide between a Tub Grinder and a Horizontal Grinder? Don’t know which trommel screen is the right size? Give us a call!